Bristol-Myers Squibb (BMS) has run into yet another hurdle as it tries to break into the lucrative first-line lung cancer market dominated by rival Merck & Co. In its fourth quarter release, BMS revealed that it has been forced to withdraw a marketing application in the US for its immuno-oncology pairing of PD-1 inhibitor Opdivo (nivolumab) and CTLA4 inhibitor Yervoy (ipilimumab) in front-line non-small cell lung cancer patients with high tumour mutational burden (TMB) after a request from the FDA for more data. The company says the US regulator wants more information about the relationship between TMB, PD-L1 expression and overall survival (OS) in these patients in a first-line setting – and that means waiting for final data from BMS’ phase III Checkmate-227 trial, expected to be ready in the next few months. There’s no chance of delaying the marketing application until the readout, however, so BMS has pulled the marketing application and will re-file later. The big unanswered question for BMS is whether it will ever be able to convince the FDA that TMB is a valid predictive biomarker. Some analysts have already raised questions about its role, pointing to interim data from CheckMate-227 which seemed to show the survival rates for high- and low-TMB patients seemed similar. Also complicating the picture is that BMS revamped the protocol of the trial halfway through. Initially designed to split between low and high PD-L1 (parts 1a and 1b) and Opdivo alone in all-comers, it was subsequently changed to look at high and low TMB instead. The tweak handed BMS a significant improvement for the combination over chemotherapy on progression-free survival, followed by promising preliminary OS data. 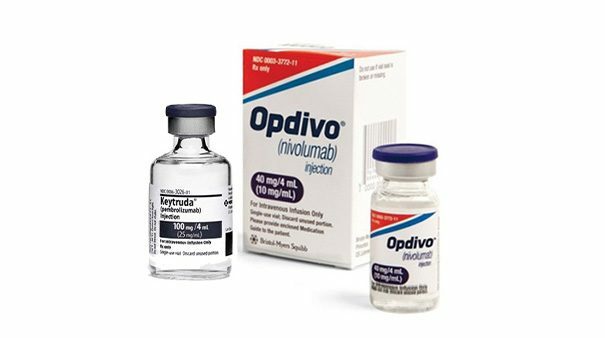 That was a big step forward for the company after Opdivo failed as a monotherapy versus chemotherapy in the CheckMate-026 trial, effectively handing the first-line NSCLC market to Merck’s PD-1 inhibitor Keytruda (pembrolizumab). Now, the entire programme also looks at risk, and if the FDA isn’t convinced by TMB that could have a knock-on effect on AstraZeneca, which is banking on the biomarker to resurrect the MYSTIC trial of its own immuno-oncology combination of Imfinzi (durvalumab) and tremelimumab. While the withdrawn marketing application headlined BMS’ fourth quarter results, the company was able to find comfort in a 10% increase in revenues for the period, including a better-than-expected performance for Opdivo which rose by a third to $1.8 billion and a 27% hike for novel oral anticoagulant Eliquis (apixaban) to $1.7 billion. BMS also talked a lot about the expected benefits of its $74bn merger with Celgene in terms of near-term product launches, with six potential product launches in the next 12 to 24 months. There was discussion on the firm’s results call about a lower-than-expected sales forecast for 2019, which BMS attributed in part to the end of a cardiovascular alliance with Sanofi last year that will trim back 2019 revenues. It’s also notable that BMS’ two biggest drugs, Opdivo and Eliquis, are both somewhat under pressure. Opdivo’s year-on-year growth rate masked the fact that fourth quarter sales were pretty flat on the prior quarter, while Eliquis is facing the threat of generic competition as well as downward pricing pressure in the US market.